The U.S. economy has been firing on all cylinders, helped along by a strong rebound in household spending, business investment, and surprising strength in net exports. Unemployment continues to fall, wages are rising, and home and stock values remain high. Household wealth has been growing which is keeping consumer confidence high. These factors have lifted Americans’ spirits, along with a tax cut that has put more money in many Americans’ pockets each month. Lower taxes, better job prospects, elevated levels of consumer optimism, and increasing household net worth have been helping many Americans spend more which is accelerating economic growth. This spending is important because 70% of US GDP is dependent on household spending. This strong economic activity has been absorbing remaining spare capacity in the corporate sector. The unemployment rate is at an eighteen year low, and there are more job openings than there are job seekers. Wage growth has been healthy and should move higher as skilled labor becomes even scarcer. Consumer price inflation finished Q2 above 2.0%, a sign that the U.S economy is bumping up against capacity constraints. The Fed, pointing to overall economic momentum and firming inflation, raised its benchmark interest rate for the second time this year. In the current quarter, the U.S. is leading the charge among developed economies experiencing a reacceleration after a slow Q1. Second quarter economic growth in the U.S. should be around a 4.0% annualized rate. If realized, this would be the fastest pace of growth since the third quarter of 2014. Encouragingly, economic growth appears broadly based, with sizable contributions expected from consumption, business fixed investment, and foreign trade. The U.S. economy, however, is not expected to sustain a 4% plus pace of growth indefinitely. For the year as a whole, 3% real GDP growth is expected, which if realized would be the fastest pace of growth in the United States since 2005. One development worth watching closely is the potential fallout from the Trump administration’s recent string of tariff announcements. In addition to instigating trade policy uncertainty and political tension around the world, there are real risks which could impact both US households and companies doing business here and abroad. Tariffs have the economic effect of increasing prices and inflation by reducing competition. Shortfalls in product inputs could constrain supplies of finished products increasing prices. Additional downside risks include lower export growth and increased global inflationary pressures. *Based on the Federal Reserve Bank of Philadelphia’s U.S. Coincident Index, our gauge of U.S. economic activity registers a May 2018 reading in the 61st percentile. Following a first quarter during which domestic and international equity indexes were generally negative, the second quarter produced mixed results. U.S. equity indexes posted positive returns while international indexes were negative. Emerging markets suffered through a difficult quarter as a strengthening US dollar put pressure on their currencies attracting investment capital back to the US (though we believe the long term growth outlook for these markets is favorable and valuations remain favorable). Fixed income markets were broadly negative as interest rates rose. The macro environment remains supportive of global equity markets. Economic growth, a strong US dollar, tax relief for households and corporations and profit repatriation are strong tailwinds which have the potential to help push US stock prices higher. Strong earnings growth and improving capital investment should also support the US stock market. As it stands now, wage growth appears manageable, slow moving, and shouldn’t drive interest rates or inflation to the point where the equity bull market rides off the rails. Our US equity market outlook therefore remains generally positive for the remainder of 2018 and into 2019. As long as the fundamentals for outlook and stock prices remains positive, volatility (absent market surprises) should remain subdued. We are however sensitive to signs of late-cycle dynamics in the U.S., including higher inflation and rising interest rates which could eventually put pressure on stock prices. Foreign markets, while attractively priced, could suffer if the USD strengthens and political turmoil in Europe and weaker economic growth in Japan continue. *Based on the S&P 500 trailing twelve month Price-to-Earnings ratio, our gauge of U.S. equity valuation registers a current reading in the 16th percentile. US fixed income markets are another story. The Federal Reserve has been using signs of economic acceleration to raise short term interest rates to head off inflation. They have done so a number of times in recent quarters and are expected to raise rates yet two more times this year. Long term rates on the other hand remain a bit of a conundrum as they have not been able to rise much beyond 3.0% for long. If you have questions, please contact us at any time. 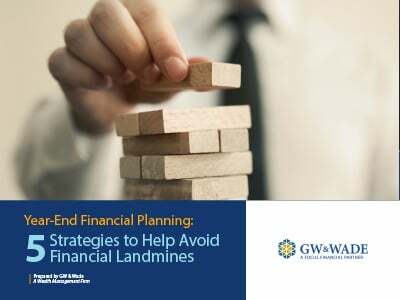 This economic and market commentary was prepared by Capital Market Consultants, Inc. (CMC), an independent investment management consulting firm, and has been approved for distribution by GW & Wade, LLC. Data used to prepare this report by CMC are derived from a variety of sources believed to be reliable including well established information and data software providers and governmental sources. CMC is not affiliated with any of these sources. Standard & Poor's 500 (S&P 500®) Index is a market capitalization–weighted index of 500 common stocks chosen for market size, liquidity, and industry group representation to represent U.S. equity performance. The Russell 2000 Index measures the performance of the small-cap segment of the U.S. equity universe. It includes approximately 2,000 of the smallest securities based on a combination of their market cap and current index membership. The MSCI ACWI (All Country World Index) is a market capitalization weighted index designed to provide a broad measure of equity-market performance throughout the world. The MSCI EAFE Index is an equity index which captures large and mid cap representation across Developed Markets countries around the world, excluding the US and Canada. The MSCI Emerging Markets Index (EM) captures large and mid cap representation across 24 Emerging Markets (EM) countries. The Bloomberg Barclays Global Aggregate Bond Index measures global investment grade debt from twenty-four local currency markets. This multi-currency benchmark includes treasury, government-related, corporate and securitized fixed-rate bonds from both developed and emerging markets issuers. The Bloomberg Barclays US Aggregate Bond Index measures the performance of the U.S. investment grade bond market. The index invests in a wide spectrum of public, investment-grade, taxable, fixed income securities in the United States – including government, corporate, and international dollar-denominated bonds, as well as mortgage-backed and asset-backed securities, all with maturities of more than 1 year. Views expressed are as of the date indicated, based on the information available at that time, and may change based on market or other conditions. GW & Wade assumes no duty to update any of the information presented above.